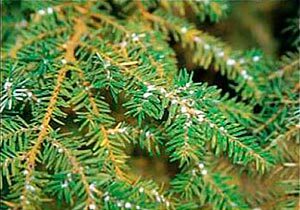 According to the Michigan Department of Agriculture and Rural Development, Hemlock Woolly Adelgid (HWA) has been eradicated from three counties across the state: two sites in Macomb County, two sites in Ottawa County, and multiple locations within Emmet County. HWA was first detected in Emmet County in 2006, then at the Macomb and Ottawa county sites in 2010. The infestations were believed to have originated from hemlock nursery stock originating from HWA-infested areas of the U.S. The infested trees at each site were removed and destroyed. Nearby trees were treated with pesticides and surveyed annually over the course of at least three years. HWA is a small, aphid-like insect that uses its long, siphoning mouthparts to extract sap from hemlock trees. Native to eastern Asia, HWA was discovered in Virginia in 1951, and has since spread over an area from Georgia to Maine, decimating hemlock stands. Over 100 million hemlock trees are present in Michigan forests, providing valuable habitat for a diversity of animals, including birds, deer, and fish. These trees are critical to the ecology and aesthetics of Michigan’s northern forests. Michigan law restricts the movement of hemlock into the state, and includes a complete ban on the movement of hemlock from infested areas. Tree owners are asked to examine their hemlocks for the presence of white, cottony masses on the underside of branches where the needles attach. If you suspect HWA, contact MDARD immediately: email MDA-Info@michigan.gov or call 800-292-3939. For more information on the HWA quarantine or other exotic pests, go to www.michigan.gov/exoticpests. Fresh pruning wounds of oak trees attract beetles that spread oak wilt. It is critical to not prune oaks from April 15-July 15 in Michigan. Oak wilt is an aggressive disease that affects many species of oak (Quercus spp.). It is one of the most serious tree diseases in the eastern United States, killing thousands of oaks each year in forests, woodlots and home landscapes. Oaks in the red oak group, distinguished by oak leaves with pointy lobes (Photo 1), are much more susceptible to the disease than white oaks, distinguished by oak leaves with rounded lobes. However, all oaks can be affected. 2015 marks the 50th anniversary of Windmill Island Gardens, a city-owned park in the heart of Holland, Michigan. To celebrate the anniversary, horticulture staff will implement a theme of “The Gilded Garden,” intended to evoke a sense of luxury, opulence and visual treasure. 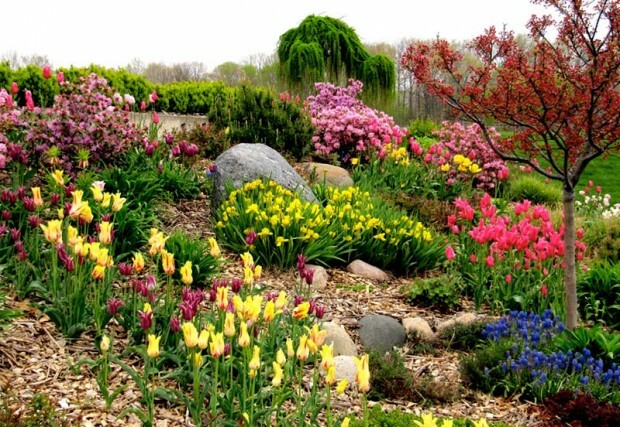 After the tulips are done blooming, annuals will be planted in their place. The gardening staff has chosen flower cultivars in as many shades of yellow and gold as possible to evoke the rich hues of summer. Vibrant masses of golden-toned blooms, stunning color, arresting foliage, and carefully chosen plant combinations will adorn each flower bed. Over 100 varieties of annuals are included in the garden plan; over 20 are new cultivars that have never been grown on the island before. Whether visitors are seeking a tranquil corner, a shady bench with a view of the windmill, or a velvet expanse of green lawn, the gardens at Windmill Island can provide a feast for the eyes and the soul. For nearly 50 years, the centerpiece of the gardens has been the 252-year-old DeZwaan Windmill. It symbolizes the authentic Dutch heritage of the community. For more information, click here. Representative Tim Kelly (R-Saginaw Twp) has introduced House Bill 4012 to allow people who live in residential neighborhoods in Michigan cities the right to have a backyard farm from which they could sell farm products. Amending the “Michigan zoning enabling act” would restore the right that many urban folks thought they enjoyed under Michigan’s Right to Farm Act. Recent regulatory changes have removed the legal protection for people who thought they had an inherent right to raise food for themselves and their families and sell any excess for extra money. Brenda Dziedzic caught the bug, or butterfly, early on. She has fond memories of the fields near where she grew up in Waterford Township teeming with butterflies at a time in her life when she didn’t know a black swallowtail from a pearl crescent. Smiles have been in shorter supply recently as the population of monarch butterflies, one of the most popular species in the United States, has been in a steep decline in Michigan and across the country. It’s a pattern experts believe was caused by a combination of factors and put the future of Danaus plexippus in question. The conference date is Saturday, March 15, 8-4 p.m. at the Wayne County Community College in Taylor. Attendees can look forward to a low-cost, high-value day of learning, along with fun surprises and shopping. There is something for everyone—from the person who wants to try gardening for the first time, to the gardening professional who wants to learn the latest in garden trends. Returning this year is the Garden Marketplace, with products including fanciful garden art, stepping stones, birdhouses, teas, indoor plants, soaps, baskets, garden tools, and jewelry. • Hortus Mortus: Plants You Gotta Have! • Vegetables of a Different Color. • Pedal Power: Creating the Signature Mackinac Island Look. Registration is $35 until February 21 and $45 after. For more information, please click here. Take home a seedling to plant in the backyard. Anyone who’s ever wondered what kinds of bugs are bad for Michigan’s trees (and how they got here) or how to identify one kind of tree from another will get the chance to learn all of this and much more at various DNR programs around the state. Details are available on the DNR website. An apple a day might keep the doctor away, but what do you do when there are no apples? It’s a question western Michigan’s apple growers are dealing with this season after strange weather earlier in the year decimated the state’s apple cultivation. Michigan is the third-largest apple producer in the U.S. after New York and Washington, but the state’s apples will soon be in short supply. Now in the middle of harvest season, growers are picking only 10 percent to 15 percent of their normal crop.